Longcuts for UIQ free download for Symbian s60 3rd and 5th edition. Using Longcuts is extremely easy. As it's name implies it is using long key presses both for setup and usage. 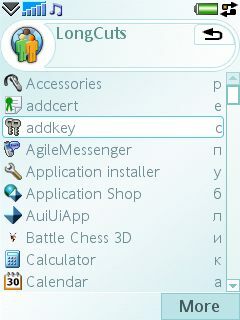 To create keyboard shortcut to an application when Longcuts main screen is active choose the application from list, press and hold a key. To invoke the shortcuts - press and hold the key when Longcuts is inactive. Alt+key and Shift+key combinations might also be used as shortcuts. please post a signed copy of this software, I am unable to install it on my m600i. Or please someone tell me how to get it signed. the sofware sounds great!! Yeah I have the same problem, I am trying to ge this sis app signed and i can't, I keep getting errors about the e-mail address I am using being invalid, can anyone work out how to get this app signed? ugh! certificate error. i have tried setting the date back and set the app manager to accept all installs but nothing. e71 new phone. ugh! i would love to have this work.